There are several suitable expression systems for the formulation of recombinant proteins in a laboratory vortex mixer, including mammalian, insectoid, and bacterial DNA. Encoded proteins are introduced into these systems and agitated using a vortex mixer to encourage the heterologous formation of recombinant proteins, yet the scalability and cost-efficiency of this process remain challenging for biologists and protein developers. Bacteria is one of the preferable expression systems as it can grow to high-densities with ease and without expensive catalyzing media, enabling simpler, faster, and larger scale fermentation. Escherichia coli (E. coli) is the primary bacterial protein expression system currently used to formulate heterologous proteins, due to its rapid reproduction rates and high protein yields. It also reduces the initial development requirements for protein manufacturing because of the robust, established genetic and physiological understanding of the bacteria. At Glas-Col, we supply an affordable vortex mixer that is equipped for microliter scale expression of recombinant proteins. 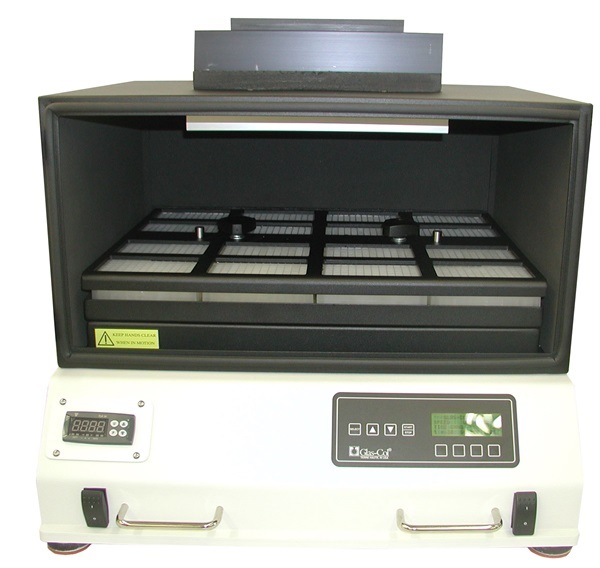 Up to 8 deep 96-well plates can be housed in the incubator and mixed at high orbital speeds of up to 1,200 RPM, with excellent temperature uniformity throughout the incubating chamber across a range of 15 – 60°C. It has been successfully used to culture recombinant proteins through E. coli expression. Bacterial expression with this apparatus is carried out using sterile, small-scale cultures of roughly 500 microliters (µL) which have been inoculated with expression clones and sealed. The vortex mixer agitates these cultures across multiple planes at speeds of up to 1,000 RPM, enabling high absorbances. This methodology formulates a high yield of material for assessing the expression, solubility, and binding to affinity purification matrices of bacterially-cultured recombinant proteins. This high throughput E. coli microliter-scale expression screening can precisely predict the fermentation conditions of bacterial protein expressions prior to large-scale cell culturing, and has been used as a screening strategy for identifying clones for direct structural analysis. Glas-Col is a leading supplier of laboratory instruments for a broad range of chemical and biological applications. Our vortex mixers offer distinct advantages for biologists examining the micro-expressions of recombinant proteins and heterogenous solution-phase synthesis, with customizable volumetric dimensions for distinct applications. If you would like any more information about using our vortex mixers for recombinant protein culturing, please do not hesitate to contact us.